The New York State Thruway Authority today announced the River Road entrance ramp to the Niagara Thruway (I-190) north in Tonawanda will temporarily close beginning early Tuesday morning, May 15, 2018. The closure is part of the next phase of the toll barrier removal process following the successful transition to cashless tolling at the Grand Island toll plazas in March. 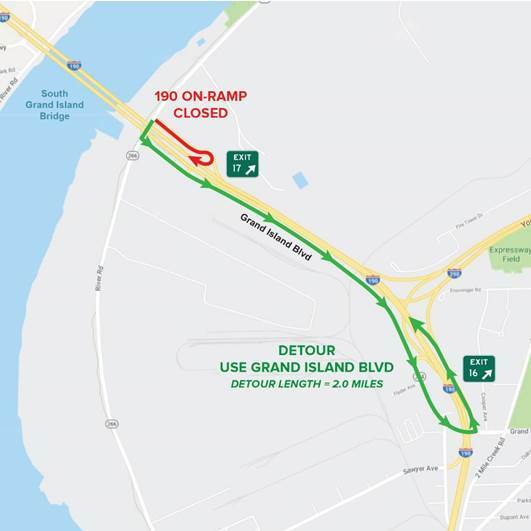 During the closure, all traffic seeking to enter I-190 north from exit 17 (Tonawandas - River Road) will be detoured south on Grand Island Boulevard and will be directed to enter I-190 at exit 16 (Tonawanda – I-290). The closure is expected to last approximately four weeks, depending on weather. Detours will be posted. The exit 17 off-ramp will remain open during this time period. Throughout this phase of construction, contractors will continue the toll booth removal process at the base of the South Grand Island Bridge, as well as pavement removal within the existing plaza area to prepare for uninterrupted open-road cashless tolling. Additionally, the River Road on ramp will be reconfigured to allow motorists more distance to merge into traffic. The River Road interchange handles approximately 5,200 vehicles per day. On March 30, Grand Island successfully became the Thruway Authority’s second cashless tolling location, the first in Upstate New York. Approximately 23.5 million vehicles that travel through the Grand Island toll plazas will benefit from improved traffic flow, reduced accidents and reduced congestion-related emissions. Drivers are strongly urged to use caution around the toll plazas during this time as it will be an active construction zone. The temporary traffic pattern for the South Grand Island Bridge can be found here. The temporary traffic pattern for the North Grand Island Bridge can be found here. Variable Message Signs will advise motorists of the bridge closure. For up-to-date travel information, visit the Thruway Authority’s interactive Traveler Map.